I’m partial to Zinfandels. 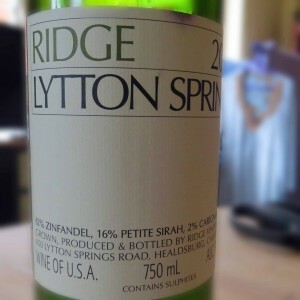 I picked this Ridge Lytton Springs Zinfandel blend up from Berry Bros & Rudd, but have since seen it at Majestic. It’s not a pure Zin, it has a good dollop of Carignan and a splash of Petit Syrah, but there’s still about 80% of Zinfandel in there. It’s a wonderful rich purple colour. It looks almost as though it would be velvety to the touch. It’s so opaque I might be tempted to let another bottle sit for a year or two, but as it was open, it needed to be drunk. It smelled good, with lots of fresh autumnal woodland fruit. It’s dry with a fresh acidity. It fills the mouth with fruit and alcohol. The alcohol level is high at about 14.5%, but it doesn’t dominate. There’s plenty of body in the fruit too. Blackberries and cherries lead the flavours, but behind them there’s some tertiary development, it almost tastes like chocolate. Think those little cherry liqueur chocolates with a booze soaked cherry wrapped in dark chocolate. This is a bit like an easy drinking liquidised version of that. The travel of flavour from fresh fruit through to liqueur chocolate is good, so watch out for the alcohol level, it’s easy to have another glass. At about £30 from Majestic or Berry Bros, this is a good wine to have as a little treat.